The second phase of Atchuvely Industrial Estate Development Project in Jaffna is now being implemented. Minister Industry and Commerce Minister Rishad Bathiudeen said the Ministry would invest Rs. 100 million for this project through 2018 budget allocations. “This would be the second industrial zone for the North East,” he said during a visit to Jaffna recently. This development project would be a new lease of life for the northern entrepreneurs to start new business ventures. Chairman, Industrial Development Board, Mahinda Jinasena said the zone will be a fully-pledged industrial zone with all the facilities to woo both local and foreign investors and will also help create new employment opportunities. The North East has lot of untapped natural resources which can be used for industries. Plans are also drawn to encourage those existing industries to boost their production and efforts are being made to attract new investors to the industrial estate. Steps have also been taken to reimburse 50 percent of the expenditure incurred in view of the electricity used by the industrialists during 2018. The required money in this regard has been set-a-side by the budget 2018, he said. Over Rs. 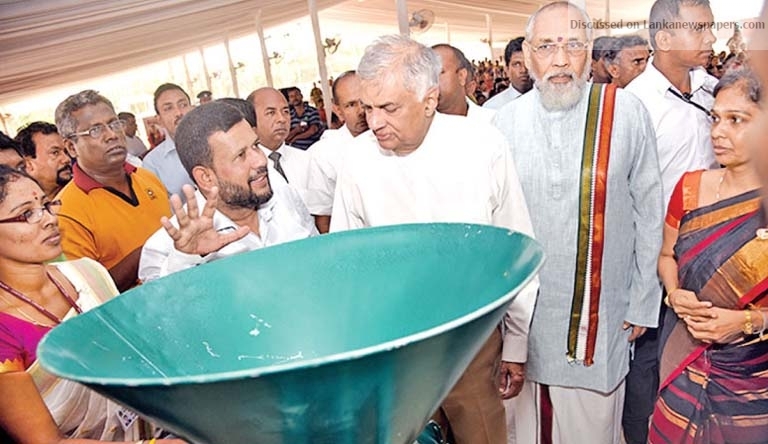 18 million worth equipment and tools to upgrade the work places of enterprises were also distributed by Prime Minister Ranil Wickremesinghe at the Diviyata Udana National Program, a concept of Minister Rishad Bathiudeen, at the Public Grounds in Jaffna recently.